Happy Thanksgiving to all my friends that celebrate here in the USA!! I made pies last night. including some of the blue eggs! I know that most of you have turkey for Thanksgiving but we had a peacock visit us. Here he is playing baby peacock. Here you can see the buffalo sauce as I was making it! It was super simple to do. had time to reflect on all the things they are thankful for in their life. I am thankful for my family and all my wonderful friends. I did get to talk with my dad tonight too. For the first time in a long time he was very lucid and so much "himself"
which was so wonderful and I am thankful for that!!! Last of the Bee Blocks? I should work on the remaining Ima Bee blocks. 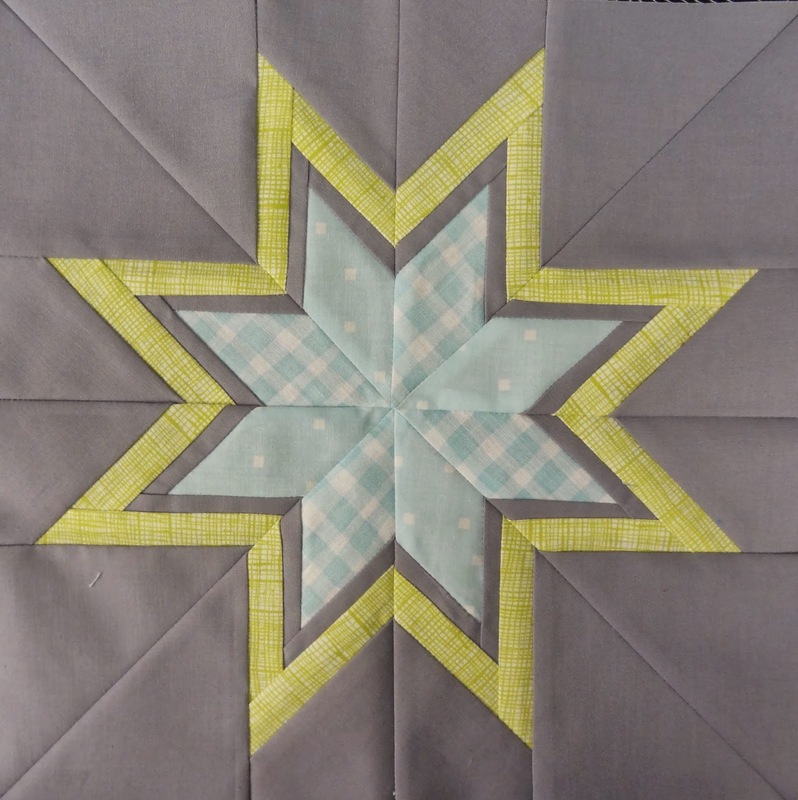 I had found a bordered star block I was dying to try out. The rules were that we had to use med gray Kona for the background and low volume for the star. This one was a lot of work and it is far from perfect but I like it anyway. reversed the background and the star colors. I will probably either make it again or make a different star and send this along anyway. 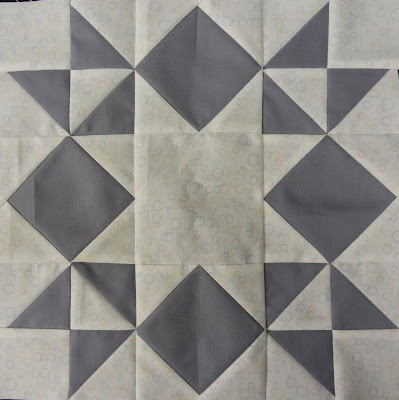 I need more medium gray though either way to make another star. I went to see Catching Fire this weekend and it was amazing!! I also went through a ton of boxes. Both boxes I brought home from my dad's and boxes from my own basement that I will be taking to my dad's on Friday for the estate sale. 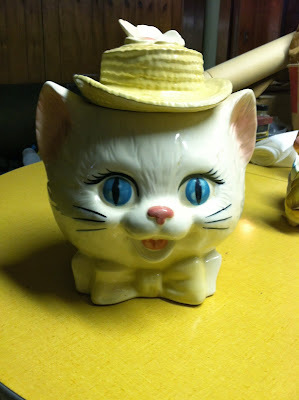 I had 9 Rubbermaid containers full of Precious Moments Figurines that I will be selling there!!! I did keep some but I just have too many and have no real attachment to most of them. My mom used to buy them and it was a nice gesture but 9 Rubbermaid boxes?? but I won't go in there to check (I secretly call it the Hell Hole). in the cement wall in the basement and it is all dirt. I make hubby go in there when I need something!! I am ISO this red print by Kate Spain from The 12 Days of Christmas. If anyone has it and is willing to swap or let me purchase it that would be GREAT. If you know a shop that still has it that would be great too. 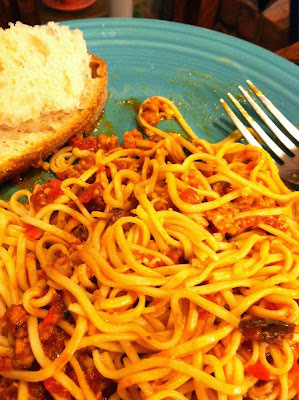 Hubby and I made pasta from scratch for dinner on Saturday night. It is so easy to do with the Kitchen Aid mixer attachment! Now I need a pasta drying rack. He made the sauce from scratch too. It's great to have a hubby that loves to cook!! I don't have a lot of time but had a few quick things to share with you. 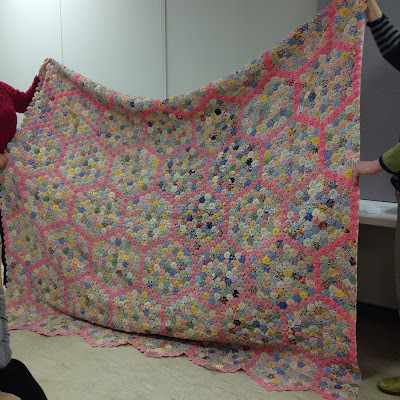 A friend managed to snap a couple of photos of the gigantic yo-yo quilt I found at my dad's house. I thought you might like to see them too. Most of the yo-yo's were in good shape. Looks like a few need to be repaired. Interestingly the pink yo-yo's appear to be made from 2 different pink fabrics. We had a textile expert at the meeting and she was able to date some of the fabrics in the quilt. There were some from the 20"s, 30's, 40's and maybe the 50's. I am pretty sure my mother's mother made this one. 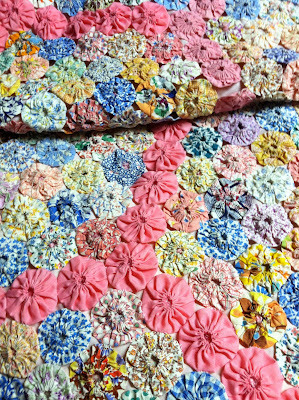 Even if you are not a fan of yo-yo's you have to appreciate all the work that went into this quilt. We did a mug rug swap at out AAMQG meeting and this little beauty came home with me! I just love the aqua and the orange together! Thanks to Stephanie for making one for me so I could participate too! JIC you might be wondering about my dad and the man that ripped off his car. I found a link to an article about him. He pleaded guilty to 2 different felonies and may be spending life in jail. This is not the first time he has ripped people off. If you are interested, here is the article. If you learn anything from this, please dear friends, remind the elderly in your life not to talk to people that knock on their doors! look for signs that an elderly/disabled person lives there (like a ramp to the house). Never give them money and never believe their stories no matter how friendly they appear! OK off my soap box now! We have my dad's car back. We had to pay for a new title, registration and license plate though. So even though he didn't commit a crime we still had to pay the money to fix it. The sale runs from November 25th - December 2nd. Please take a moment and stop over to the shop and take advantage of her great sale. Let her know you found her from my blog! Your block is the best I have seen so far! 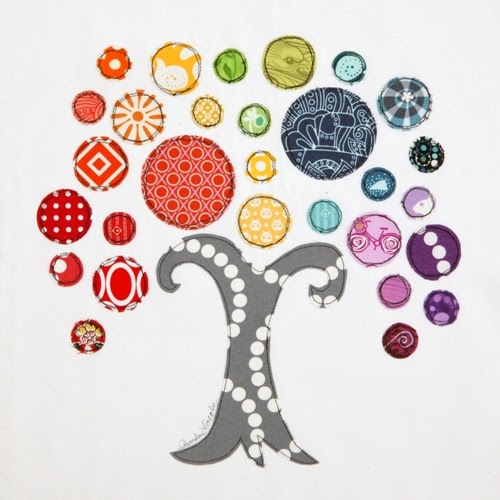 I am a dot and circle maniac so I may be slightly prejudiced. 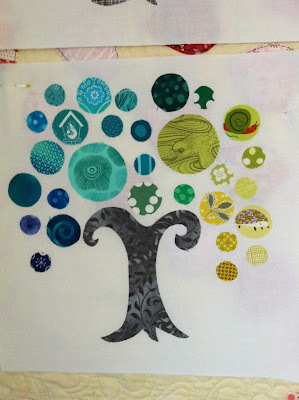 This will be my next scrappy quilt block. 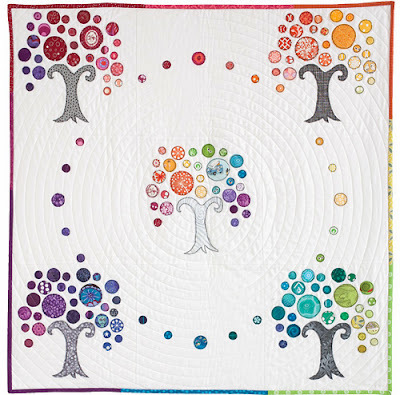 LOVE, LOVE, LOVE the modern quilt design "Ring Around the Rainbow Forest!" It is in my future. Thanks Regina, I have emailed you and will send your copy right out as son as I get your address. Quilt maker's 100 Blocks Blog Tour. You left such nice comments! I have not had the time to respond to all of them, you completely overwhelmed me! It was so nice to know that the block and quilt were so well received, thank you for your kindness. I will be drawing a name for the magazine on Friday. Anyone that left a comment with a contact email address will be in the drawing! Now on to some new stuff. 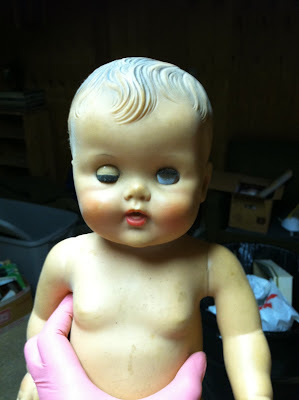 You all know that I have been cleaning out my dad's house and getting it ready to sell. I found a few things I thought I would share with all of you. There are more things but no photos of those yet! 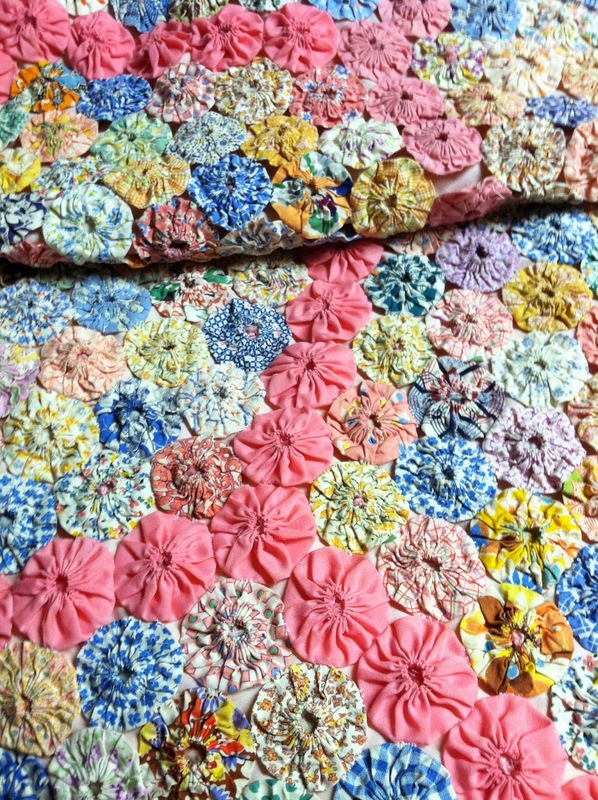 I have come to realize that my maternal grandmother was a quilter. I found this gigantic yo-yo quilt while cleaning in the basement that I am assuming was made by her. Each yo-yo is about the size of a quarter and there are thousands of them. I need to spread it out and get a better photo but you get the idea. Then I found this amazing old cookie jar that is a cat head. A good friend suggested I put it in my sewing room and keep my buttons in it. I don't think I have enough buttons, but maybe thread! I also found this old wooden puzzle that my uncle made for us when we were kids. I guess I liked making quilt designs even as a child! 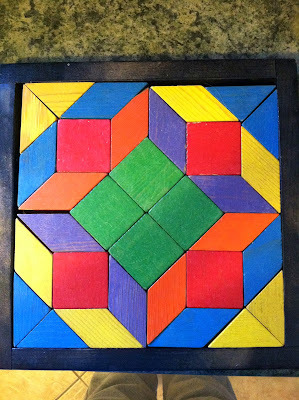 WQ (wooden quilts) for the technologically challenged? maybe? 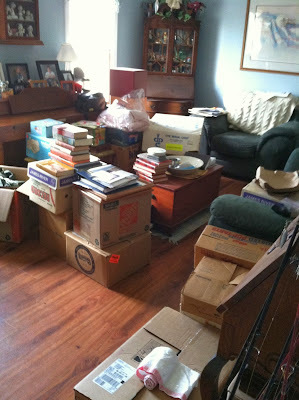 This is what my living room looks like right now. 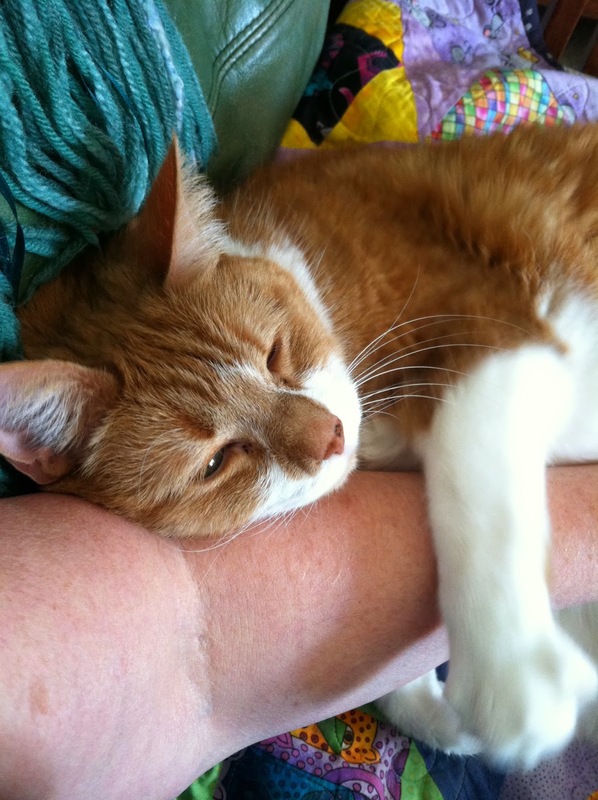 But it's ok because I have cats like Aiden here that love me unconditionally! Welcome To The Blog Tour! to be included in Quilt Maker's 100 Blocks magazine volume 8!!! The magazine goes on sale November 19th. There will be a blog tour from November 11-15 including prizes. 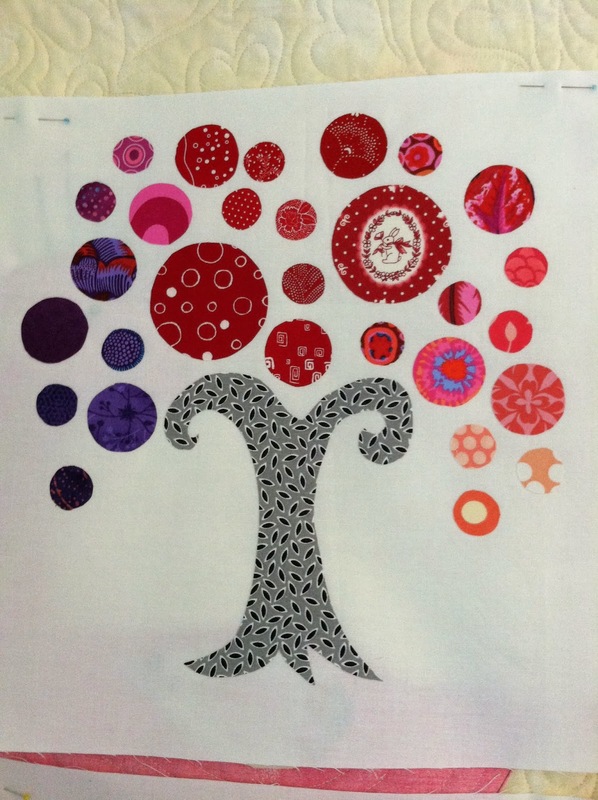 The Quiltmaker Blog Quilty Pleasures. 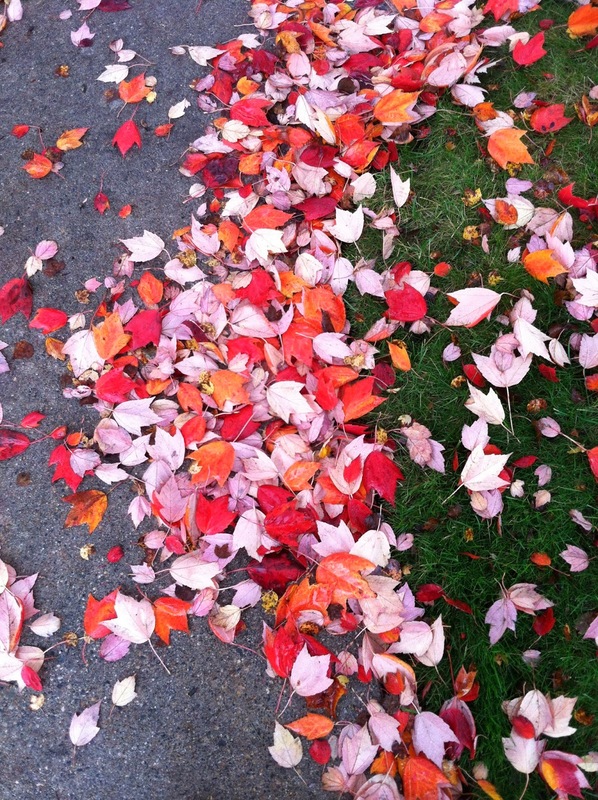 Please stop by for inspiration, ideas and giveaways! I bet you want to see the block I sent in right? I have been dying to share it with all of you. I can finally do that now! 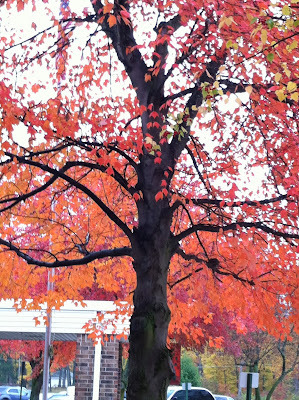 It is called the Rainbow Gum Tree. Can you find the bunny face in one of the circles? We were given the opportunity to make a quilt to submit that would also be included in the magazine. Even though my life has been one hot mess of late I decided to go for it. 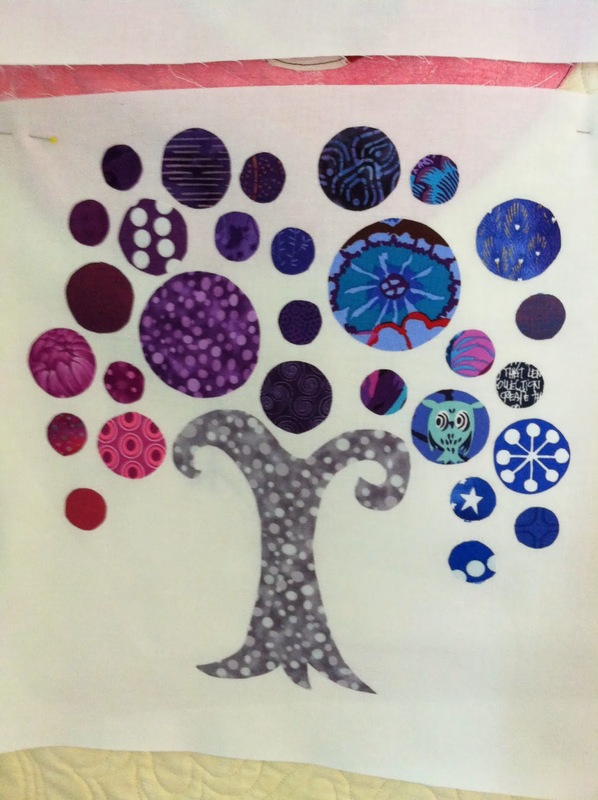 The plan for the quilt came to me one night as I was falling asleep. I wanted to make 5 trees total. Four in the corners and one in the center. 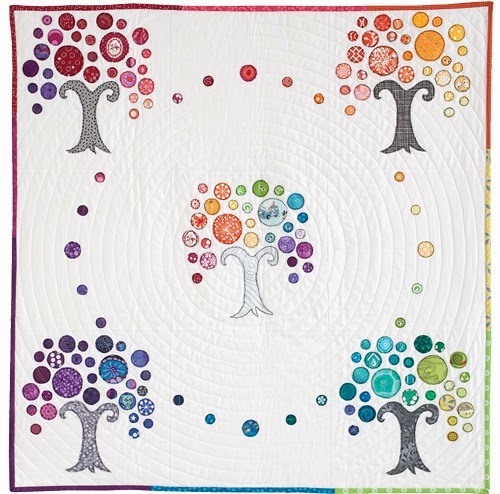 I wanted to do a rainbow progression all the way around the quilt. I got the first 2 blocks finished and they looked great! 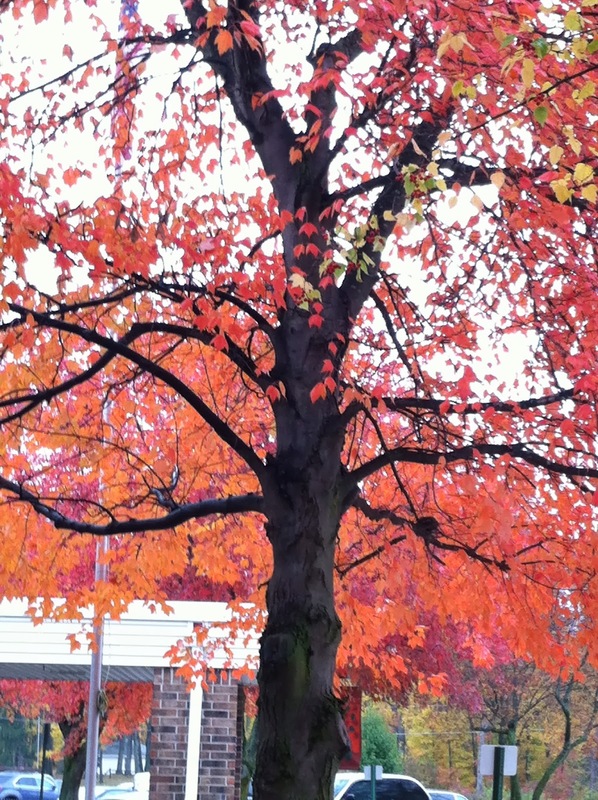 Notice that the outside tree trunks are dark gray and the center one is different. Then began on the bottom two. OOPS the top ones needed to progress from left to right and the bottom ones from right to left. I ended up making that blue/green one twice! I am pretty happy with it now though! Choosing the fabrics and making the progression was so much fun! You just might find a heggie or an owl or something crazy in this forest!!! I needed to make another total rainbow block too. Next was to put it all together. then spiral quilted it on my Bernina. I am calling this Ring Around the Rainbow Forest. I even decided to make the binding a rainbow progression to follow the theme. This little quilt was so much fun to make! I kept thinking of other possibilities as I was making this one. make it larger and use that as a centerpiece for a baby quilt. The possibilities are as limitless as your imagination!! Here are a few "in Progress" shots too. 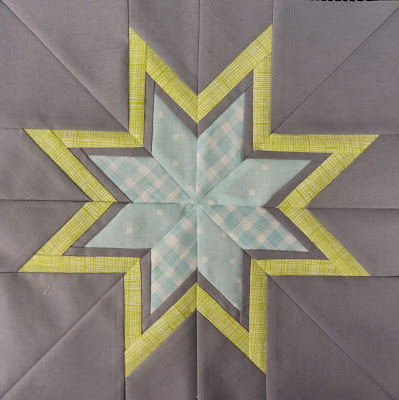 for a copy of Quiltmaker's 100 Blocks magazine volume 8. Then you would have my pattern to make this special forest for yourself! Be certain to leave your email address. I can't send you your magazine if you are a no reply! I have directions on how you can fix that on my side bar too. The winner will be posted on November 16th. 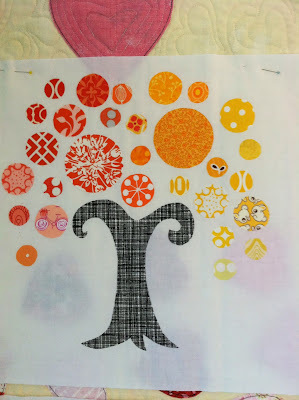 If you do make a block or a quilt I would love to see it. Please post it to my Flickr group! Don't forget to leave a comment on the 100 Blocks blog telling them how much you love this block. Pinch me I can't believe this is happening!!! I feel like my life is in limbo right now. With all the things I have to do for my dad and sisters I feel like my entire life is on hold. to get some stuff straightened out, which we did. then went to the rehab place to meet with dad and the lawyer to get his trust finished up. He has a UTI so his rehab is on hold a bit, but he is progressing, which is good news. We will be there on Friday too. Because going once a week was clearly not good enough! Last Friday we did some more cleaning. I thought I would share some of the cleaning and sorting and treasures we found. You can see what it looked like in the beginning here. 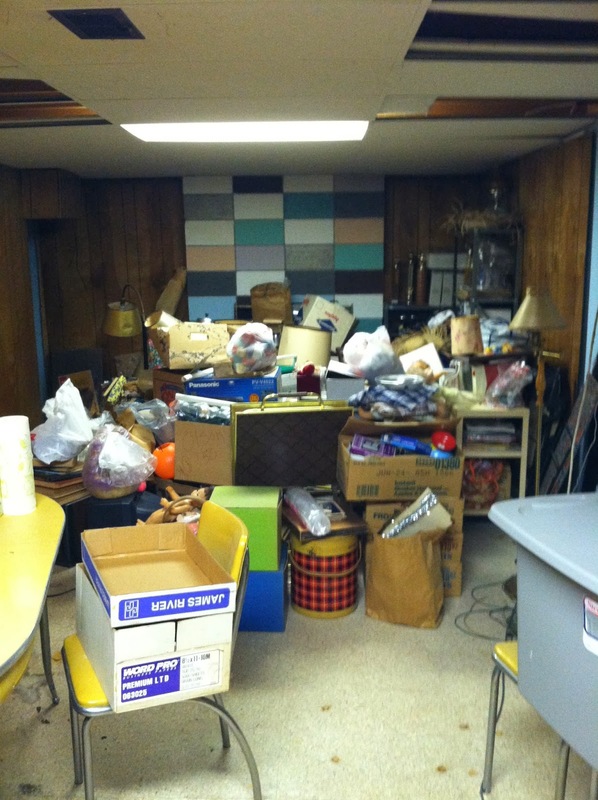 When we first started the entire basement looked like a version of horders. 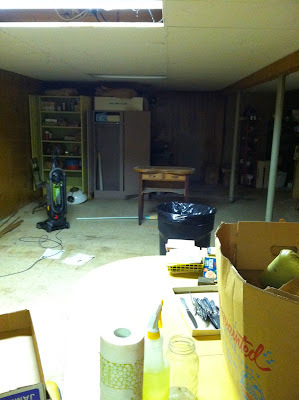 It is completely under a ranch upstairs so it is a long rectangle. and the other is laundry and workshop. We were working in the "stuff" side. Think about 4 bedrooms worth of area on that side, about 10 x 10 foot rooms. and have condensed it into one room. That is all stuff slated for the estate sale. We have kept very little, maybe a few boxes of personal things. This picture is facing one end of the basement. 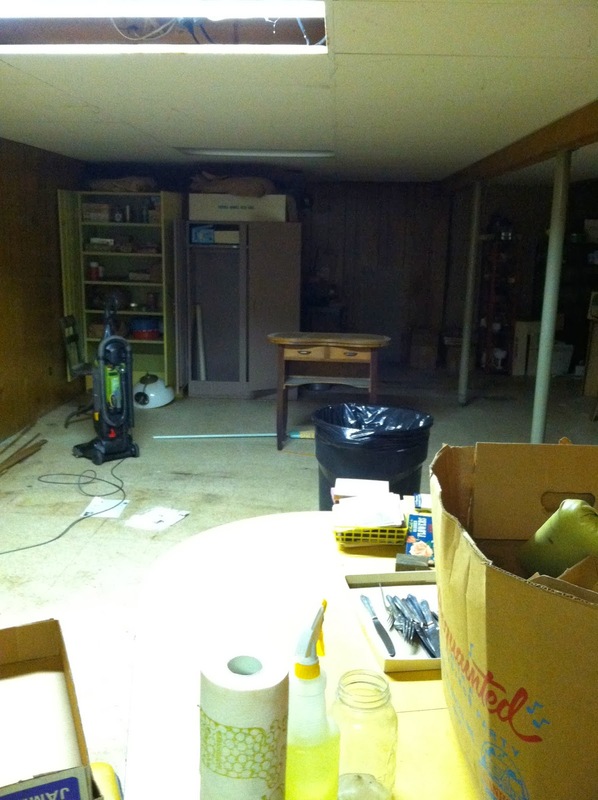 Now when I turn around you can see the rest of the basement on the "stuff" side. YEAH us, we have it almost all cleared out!!! and to the right of them is about the equivalent of one more rooms worth to still go through. We are leaving the cabinets and filling them with more "stuff" for the estate sale. They will go through all the stuff we leave and sort and price it all. Thank goodness we don't have to do that. And Yes, that vacuum you see is ours. It was moldy and there were spilled potted plants so lots of dirt that we had to vacuum up. I did find a few treasures though. 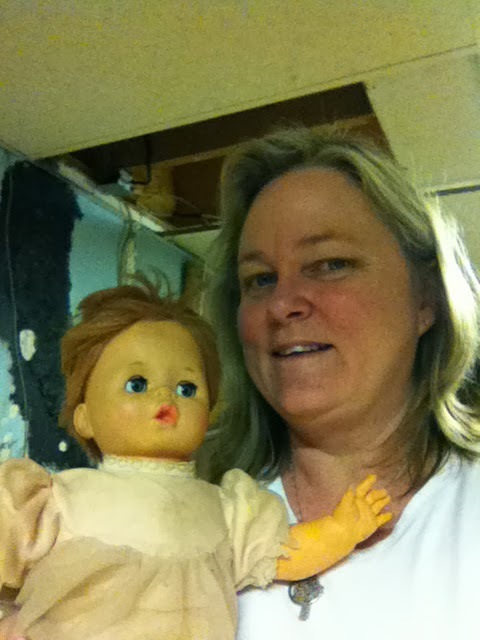 Here are a few things I found in the basement. I found my old baby doll, Pat-A-Burp and she still burps! 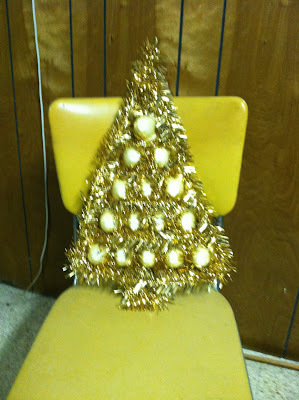 I found this Christmas tree made out of egg cartons and tinsel. One of many creepy baby dolls. And yes, those are gloves I am wearing, everything was covered in dust and mold dust, YUCK! 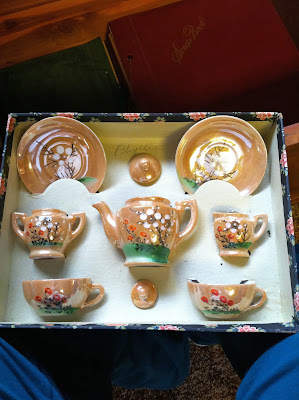 Now upstairs in my mom's cedar chest I found some really neat things. My favorite one when I was a kid was the third one on the left, the one in gold. You can also see a quilt on top, in the center of the chest. I was thrilled to find that but forgot to take another photo of it. 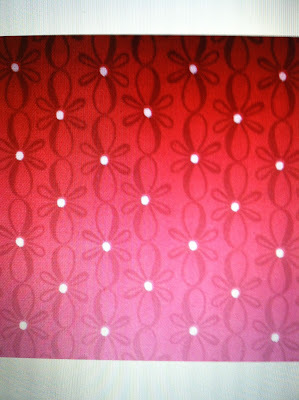 My mom's mom was a quilter. She died when I was only 2 so I never knew her. 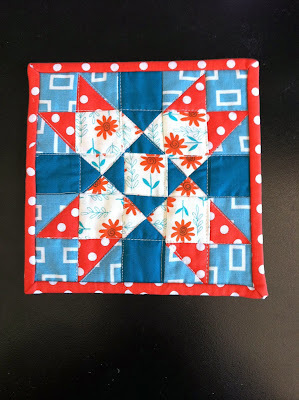 My mom sewed but did not quilt. 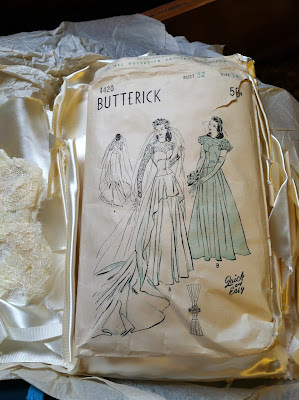 I found my mom's wedding dress and left over fabric with the pattern used to make the dress. 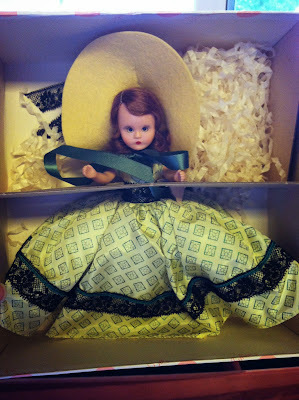 I knew her dress was in the cedar chest but did not know about the pattern. I tried it on when I was going to be married but my chest was too big and my hips too small. HA, wish I could say that now!! and I didn't want anything to do with her wedding stuff. The dress really was beautiful though, made out of satin. I have to say 1948 satin is much nicer than 2013 satin! 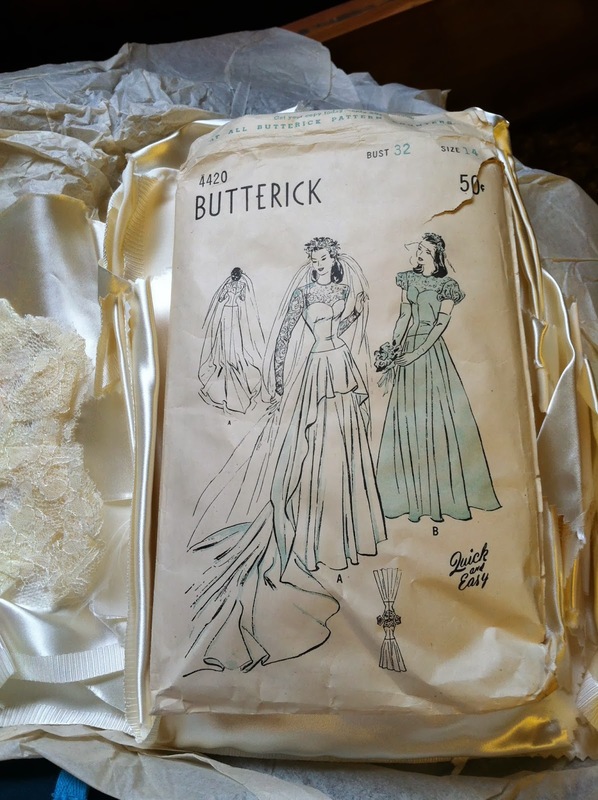 Maybe I can use it for a baptismal gown or first communion dress someday? or at least it did not say so on the box or the doll. I found this amazing Japanese tea set. It is for a children's tea party. or my Great Aunt that did a lot of traveling. My parents were friends with a couple named John and Mei. They actually introduced my parents. I am named after Mei. My middle name is Mei. I hated it growing up and made my mom use it for my younger sister's middle name too. I actually like it now, Pamela Mei. I guess it's grown on me! 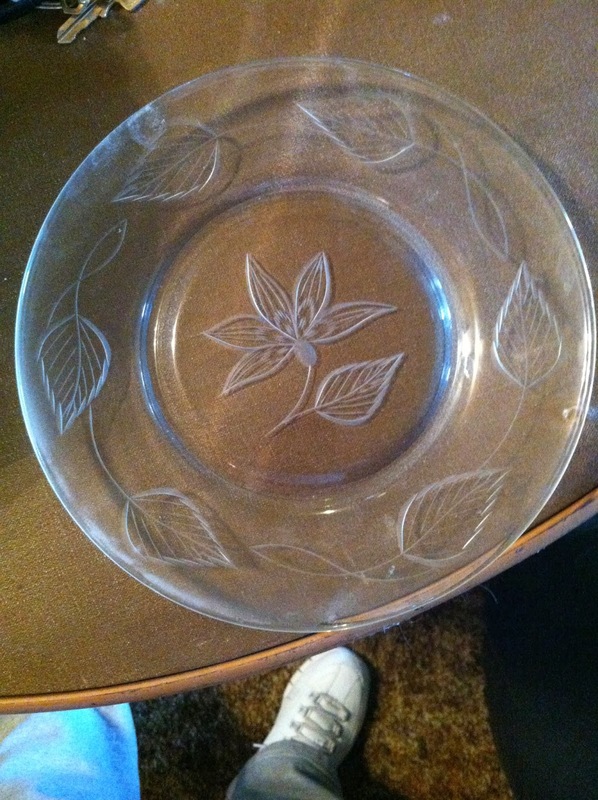 I also found some glass, plates and stemware but I can't seem to be able to identify it. 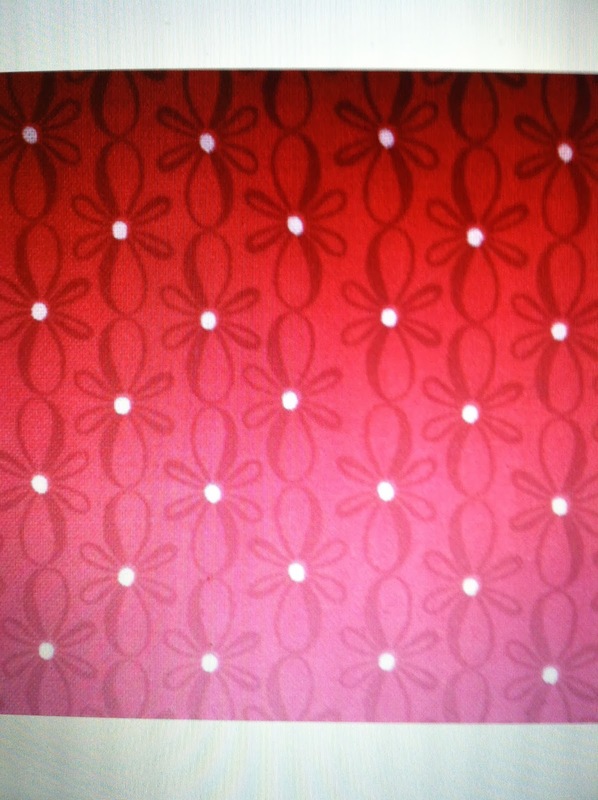 Anyone happen to know what this pattern is? I had to go to my sister's place and the trees were so beautiful last weekend. 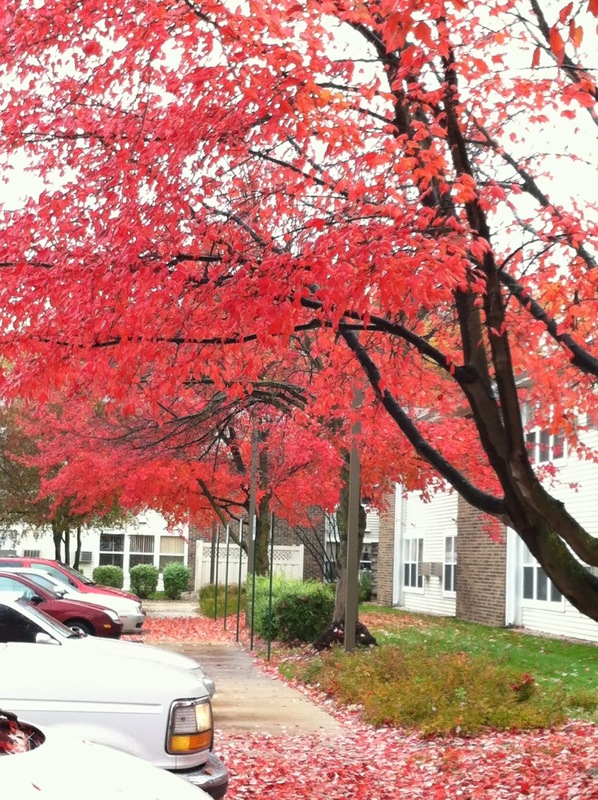 Fall in Michigan is amazingly gorgeous! I do have something really exciting to share with all of you but I won't be able to share it until November 11th. I do hope you will stop back. There will be a giveaway associated with it!